I’ve written before about the dichotomy of challenges present in conceiving and selling just about any microdistillery whiskey, but it boils down to the following: Degree of uniqueness vs. price point. Whiskeys from independent microdistilleries almost have to be unique on some level. Using classical mash bills or traditional techniques will produce familiar profiles that can compete with the best that the big guys have to offer in terms of quality, but the catch is that they’ll invariably be more expensive, which is where “price” comes in. A microdistillery can’t make a basic, two-year straight bourbon for the rock bottom prices of a big distiller. They therefore have two choices: Either make that whiskey anyway, and sell it for more, or make something more unusual and hope that the novelty justifies the resulting price. Distillery 291 is one of the microdistillers that has clearly chosen the latter. With a focus that is almost entirely on whiskey, these guys have gone all in on their concept and their technique since opening in 2011, and it’s unique in quite a few ways. First there’s the odd craft beer connection, which hardly seems to be mentioned in most of the reviews written about 291’s whiskey, but 291 uses what they call “The El Paso County Process” to “take the stillage of IPA beer and add it to the mash” for all of their whiskey. This would seem to imply that a variety of different malted barley varietals are involved. More important, though, in my mind, is the distillery’s focus for whatever reason on malted rye—something fairly uncommon in distilling, although gaining some steam in the micro world. Their flagship Colorado Rye Whiskey is 61% malted rye, rather than the regular, unmalted rye that you would find in just about any big distillery product. Likewise, they use malted rye rather than unmalted rye in products such as their bourbon, where it makes up 19% of the mash bill. Suffice to say, it has a huge impact on the flavor profile in both places. So, let’s get to it and taste a duo of Distillery 291 bottles. As mentioned above, this flagship rye is made from a 61% rye, 39% corn mash, and aged for less than two years in newly charred (but much smaller than standard) 10 gallon barrels, to speed the aging process, something that is contentious among distillers in terms of how well it replicates slower aging in larger barrels with less surface contact. It’s then finished on “toasted Aspen staves” to give it a nicely local Coloradan touch—it’s hard to say exactly what they contribute, but it’s a nice usage of the local flora. It’s bottled at just above 50% ABV, at 101.7 proof. On the nose, what I’m initially getting here is some very rich, sweet whiskey with a lot going on. Deep, dark caramelization is present, without a ton of oak to back it up, and it’s also quite grainy—rye bread and creamed corn all at once. It’s also fruity, with lots of red fruit in the mold of cherry and plum, but a sweetness that is more honeyed, which reminds one of Irish whiskey. This is no doubt the contribution of all that malted rye, which tilts the overall impression away from “American rye whiskey” and into a crossover with Irish whiskey or scotch, sans the absent peat and smoke. On the palate, this stuff is pretty hot, even considering the 101.7 proof, but it’s sure as hell not lacking in character. It immediately bursts with a ton of spice on the palate, but it’s not exactly what you’d call elegant—”brash” is more the word. Rye grain and rye bread come through more strongly here than on the nose, although the quality of the woodiness has a sawdust quality that belies the whiskey’s young age. Red fruitiness is likewise present, but the residual sugar and honeyed, Irish whiskey quality tend to dominate. I can’t help but wonder what this same whiskey would be like if it wasn’t malted rye, and I suspect that I might enjoy it a bit more. Still, this probably has a place for those who are interested in assertive young ryes and can handle a bit of heat. It’s more adventurous than a lot of similarly aged ryes I’ve sampled from microdistilleries, but it will have a tough time justifying a $70 MSRP to a lot of potential customers. 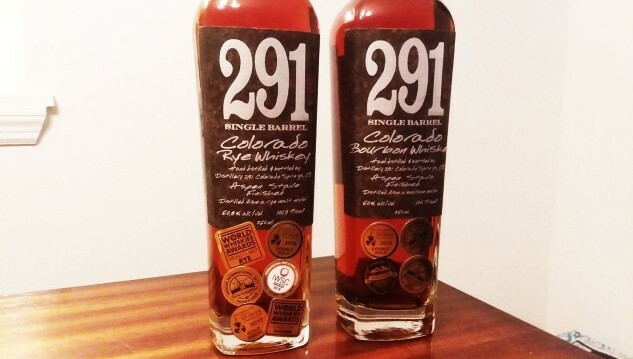 291’s Colorado Bourbon doesn’t get quite the same level of marketing hoopla as the rye, but it was actually the offering I enjoyed a bit more, of the two—perhaps because the influence of the malted rye is tamped down a bit and made a more cohesive piece of the whole. This one is 80% corn, 19% malted rye and 1% malted barley, likewise aged less than two years in 10-gallon oak barrels and finished on Aspen staves. Like the rye, it’s a single-barrel product, bottled at a sturdy 101.7 proof. Overall, this entry is less bombastic than the rye, and more composed. On the nose it immediately comes off as drier and somewhat “dustier,” while also containing pleasant traces of the former’s honey sweetness and some impressions of toffee. It’s less fruit driven as well, and altogether more subtle. On the palate, plenty of sweetness still remains, but it’s within reason—in fact, what it reminds me of is a wheated bourbon in the vein of W.L. Weller, although there’s no wheat in the mash bill. There are some nice flavors of cinnamon and nutmeg spice here, and rich toffee and caramel, although the wood still has that sawdust quality. As I go back for repeated sips, some red fruit starts to unfold, with a nice note of stewed plums. Arguably this bottle is more simplistic than the rye, but I appreciate its greater approachability—even the alcohol character seems less hot to me here. Like the rye, it retails for around $70 MSRP, but I’d have an easier time justifying this one. Jim Vorel is a Paste staff writer and resident brown liquor guru. You can follow him on Twitter for more drink writing.